Purple Pen is a Windows application. See here for information on using Purple Pen on Mac or Linux. 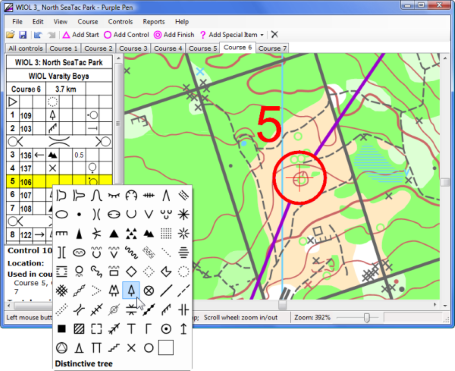 Purple Pen is course setting software for orienteering. Purple Pen makes it easy to design orienteering courses and their associated control descriptions. Print maps with courses overprints directly (without needing OCAD), or export course maps to OCAD or OpenOrienteering Mapper for final printing, or create PDF files for a print shop. Use either an OCAD map (OCAD versions 6-12 supported), OpenOrienteering Mapper map, PDF map, or bitmap map (JPG, GIF, PNG, TIFF, BMP). Print a perfectly formatted control description sheet, with symbolic or textual descriptions (or both). Textual descriptions are automatically generated. Description sheets can be placed onto the map. Calculate the length of each course automatically. Make sure that the codes and descriptions of shared controls are in sync. View or print an all controls map. Easily change control codes — one at a time or all at once. Calculate how many competitors are visiting a control or running a leg. Print master punch cards for easy control card checking. Export course data to event management or electronic punching software (IOF standard XML format, version 2 or version 3). View or print several different reports about the courses and controls. Download control locations to your mobile GPS device. Supports both the IOF 2000 and 2018 control description standards. Best of all, Purple Pen is completely free software. Purple Pen runs on Windows XP through Windows 10. On Mac or Linux, a Windows emulator such as Parallels or VirtualBox is required. See here for more information. Purple Pen is available in English, French, German, Swedish, Spanish, Norwegian (Bokmal and Nynorsk), Finnish, Polish, Hungarian, Bulgarian, Romanian, Estonian, and Japanese. Documentation in English and Norwegian only. Purple Pen directly loads and displays an OCAD map for your event. OCAD versions 6, 7, 8, 9, 10, 11, and 12 are supported. For those using OpenOrienteering Mapper, Purple Pen fully supports that file format (.omap/.xmap) also. You design your courses directly on the OCAD or OOM map, which can be displayed at any level of detail. You can also use a bitmap file such as TIFF or JPEG as a map, or use a PDF file as a map. Purple Pen uses a simple user interface with a single window that displays both the course and control descriptions simultaneously. Many changes can be done by simply clicking on what you want to change and making the change directly. No special "preview" modes -- everything is live all the time. Every change can be undone, with up to 100 levels of undo and redo. Simplicity was the guiding principle in designing Purple Pen. Purple Pen fully supports the IOF 2004 and 2018 Control Description Standards. Purple Pen can create standard IOF XML interchange files (both version 2 and version 3), which allow the course data to be directly transferred to electronic punching or event management programs. Although designed for simplicity, Purple Pen handles your advanced needs also. Add a map exchange to a course and print separate or combined maps and control descriptions. Add variations to a course (also known as relays or gaffling). Add additional text, lines, or images onto your maps. Get a complete cross-reference of every control and which course uses it. Compute the competitor load of all controls and legs. Create master punch patterns for pin-punches. Export IOF XML files for electronic scoring systems or event management systems. Automatically create text versions of control descriptions, in any of 18 supported languages. Customize the text also. Add additional text before, after, or in the middle of the control description. Click the button above to download the latest released version of Purple Pen. Run it to install Purple Pen on your computer. Purple Pen requires Windows XP SP3, Windows Vista SP2, Windows 7, Windows 8, or Windows 10. It requires the .NET Framework to run (2.0 for versions 1.x, 4.0 Client for versions 2.0 and later). If you do not have this installed on your machine, the installer will automatically download and install it onto your machine. If you wish to install on a machine that is not connected to the internet, you can manually download, copy, and install the Microsoft .NET Framework from here. On Mac, a Windows emulator such as Parallels or VirtualBox is required. See here for more information. Purple Pen has detailed instructions included with the program. It is highly recommended that new users of Purple Pen read over the documentation. To start reading the documentation, chose "Purple Pen Help" from the Help menu. Several people have produced videos that teach the use of Purple Pen. Sometimes existing problems on your Windows installation prevent Purple Pen from starting. The following steps usually can resolve these problems. Turn your computer fully off, then on. Make sure you have at least 1GB of free disk space. Delete files and empty the recycle bin if you don't. Uninstall Purple Pen using "Uninstall a Program" from Windows Control Panel. (Replace <username> with your username.) Note that the AppData directory may be hidden in File Explorer; it should be visible if you followed the previous step. PDF map file does not load or appears incorrectly. Purple Pen relies on Google Pdfium to read PDF files. Sometimes badly formed PDF files will not be converted correctly by this program. You can convert these "bad" PDFs to "good" PDFs with the following procedure. Open the "bad" PDF in Adobe Reader. In Adobe Reader, select "Print..." from the File menu. In the "Printer" drop-down list at the top, select "PrimoPDF". In the "Page Sizing & Handling section, click the "Size" button. Check "Choose paper source from PDF page size". Check "Use custom paper size when needed". When the PrimoPDF dialog appears, click "Create PDF" and save the PDF to a new file. This PDF is your "good" PDF that should load correctly into Purple Pen. Purple Pen is free software. There is no guaranteed support. However, support is provided via the Purple Pen mailing list on Yahoo Groups. If you have a question, problem, or suggestions, please join the mailing list and ask. Most likely, someone will be happy to help you. Purple Pen is continuing to evolve. We want to hear your suggestions as to what needs to be fixed or added to make Purple Pen the best and easiest program for course setting. Please join the mailing list and let us know how Purple Pen can be improved. You can also supply feedback through the Purple Pen Uservoice Forum, which allows you to suggest new features and vote on features that others have suggested. Go to http://purplepen.uservoice.com to contribute there. Purple Pen is open source software. As such, we welcome contributions and help from any and all interested people. The easiest and most important way that you can help to improve Purple Pen is by giving feedback. In order to improve it, we need to know what is broken, missing, or could be better. Please join the Purple Pen mailing list on Yahoo Groups, and tell us what you think. If you want a change, tell us about it! We'd like to make Purple Pen available as many languages as possible. If you are fluent in another language and would like to help translate Purple Pen, see information about translating Purple Pen here. A computer program is no good if no one knows how to use it. If you like to write or edit, we'd love to have help improving the documentation for Purple Pen. Drop us a line on the mailing list. If web site design or writing is your bent, this web site could undoubtedly use improvement also. If you'd like to donate money to cover expenses and support further development, you can donate money via PayPal here. This page collects some other useful computer tools related to maps and orienteering. Ocad2Png is a Windows command line tool that creates a PNG bitmap file from an OCAD file, or a portion of it. Options allow determining the size of the output, which part of the OCAD file to use, whether to include templates/background maps, and other options. Ocad2Png is useful for applications such as seeing where maps have changed, or automating various workflows involving OCAD maps. To use the tool, download and run the setup program. Once complete, open a Windows command prompt and type "Ocad2Png". You should get instructions on all the command line options. You can show your appreciation for Purple Pen and support future development by donating! Please note that donations to Purple Pen are not tax-deductible for income tax purposes. To donate, click on the donate button below the currency and country/language you prefer. You will be directed to Paypal to complete your donation. We fully appreciate the generosity of those who donate to Purple Pen, and it is very important to us to maintain your trust. If you use PayPal, they will require certain personal information from you in order to create and establish an account. Some of this information, such as your name, e-mail address, and donation amount will be transmitted to our PayPal account upon receipt of donation. Other details will only be held by PayPal, and not sent to us. Rest assured that the details of any donation received by Purple Pen will be kept private and never sold or otherwise divulged to any third party. Version 3.2.1 has been released. This has a fix for the wrong font used for control numbers in some rare cases. Version 3.2.0 has been released. This has a large number of new features, plus several bug fixes. Included is a new font for descriptions and numbers, a Create Image File command, Create PDFs for descriptions and punch cards, georeferenced image for RouteGadget, better support for timed start away from the start triangle, fixed size text, and several fixes and improvements for relays. You can see the full description of the fixes here. Version 3.1.6 has been released. This is a fix for a bug involving relay teams where the team number starts at a number other than 1. Version 3.1.5 has been released. This is a bug fix release, with some minor new features. Italian control description language is now available. Version 3.1.4 has been released. This is a bug fix release, but also includes a re-written setup program. Version 3.1.3 has been released. This includes support for OCAD 2018 files, as well as fixing the size of the finish circle when ISOM2017 is selected. Version 3.1.2 has been released. This includes a bug fix for rendering of OCAD 12 new patterned area options, and support for loading files created by OpenOrienteering Mapper 0.8.0. It also includes a new feature for viewing multiple courses at the same time, that I would love to hear feedback on. Several other bug fixes are also included. Version 3.1.1 has been released. This includes a bug fix for the Event Audit feature with the 2018 control description standard (thank you David Rosen), and fixes for some missing help topics. Version 3.1.0 has been released. This includes support for the 2018 control description standard, ISOM 2017, and adding a map issue point. Also includes some performance improvements. Version 3.0.1 has been released. Various bug fixes. Final release of version 3.0.0 has been released. It fixes issues relating to loading certain OpenOrienteering Mapper files. Beta 4 of Version 3.0 has been released. It fixed one bug with PDF file created over Beta 3. Please send your feedback to the Purple Pen mailing list. Because this is a beta release, you must download it manually by selecting "Purple Pen 3.0.0 beta 4" from the download page. Beta 3 of Version 3.0 has been released. It adds support for Open Orienteering Mapper files, course variations and relays, and much better PDF file reading. Please send your feedback to the Purple Pen mailing list. Because this is a beta release, you must download it manually by selecting "Purple Pen 3.0.0 beta 3" from the download page. Beta 2 of Version 3.0 has been released. It adds support for Open Orienteering Mapper files, course variations and relays, and much better PDF file reading. New to beta 2 is 64-bit execution. Please send your feedback to the Purple Pen mailing list. Because this is a beta release, you must download it manually by selecting "Purple Pen 3.0.0 beta 2" from the download page. Beta 1 of Version 3.0 has been released. It adds support for Open Orienteering Mapper files, course variations and relays, and much better PDF file reading. Please send your feedback to the Purple Pen mailing list. Because this is a beta release, you must download it manually by selecting "Purple Pen 3.0.0 beta 1" from the download page. Version 2.6.2 is released. This release adds support for IOF XML version 3, and has other enhancements for XML export. It also changes the behavior to better support high resolution displays. You can see the full list of fixes and features here. Download it from the download page. Version 2.6.1 is released. This is a primarily a bug fix release, but also contains support for Polish control description text. You can see the full list of fixes and features here. Download it from the download page. Version 2.6.0 is released. The biggest change is an updating of how paper sizes and print areas are handled, but also adds multi-line text in the middle of a description, Chinese (Traditional) textual descriptions, and several bug fixes, and support for the OCAD 12 file format. You can see the full list of fixes and features here. Download it from the download page. Version 2.6.0 beta 1 is released. The biggest change is an updating of how paper sizes and print areas are handled, but also adds multi-text text in the middle of a description, Chinese (Traditional) textual descriptions, and several bug fixes. You can see the full list of fixes and features here. Download it from the download page. Note that you must select the beta 1 version from the detailed list of downloads; the large "Download Now" button downloads the most recent stable version (currently 2.5.0). Version 2.5.0 is released. A number of feature additions: duplicate course command, custom course length, help people when moving shared controls, Japanese description text, plus other features and bug fixes. More details here. Version 2.4.0 is released. This allows blending of the purple color with the background map. It also adds GPX file creation to download control locations to a mobile GPS. More details here. Version 2.3.2 is released. This allows customization of the automatic gaps created when legs cross. More details here. Version 2.3.1 is released. This is a bug fix release. More details here. Version 2.3.0 is released. This adds several new features, including the ability to add images, rectangles, and lines to your map. More details here. Version 2.2.4 is released. This adds the "white outline around numbers" option to Customize Course Appearance. More details here. Version 2.2.3 is released. This fixes several bugs. More details here. Version 2.2.2 is released. This fixes problems on monitors with high DPI settings. More details here. Version 2.2.1 is released. This fixes a few bugs with background maps. More details here. Version 2.2.0 is released. This adds display of background maps in OCAD map files. More details here. Version 2.1.0 is released. This adds both the ability to use a PDF file as a map file, and also the ability to create PDF files of the final maps/courses directly. More details here. Version 2.0.3 is released. This adds the ability to show the finish on parts of a multi-part course (course with map exchange). Version 2.0.2 is released. This fixes a few bugs. You can see the full list of fixes here. Version 2.0.1 is released. This fixes a few bugs. You can see the full list of fixes here. Version 2.0.0 is released. This fixes a few bugs in the previous beta. You can see the full list of fixes here. Version 2.0.0 Beta 3 is released. This fixes a few bugs in the previous beta. You can see the full list of fixes and features here. Download it from the download page. Note that you must select the beta 3 version from the detailed list of downloads; the large "Download Now" button downloads the most recent stable version (currently 1.2.2). Version 2.0.0 Beta 2 is released. This fixes several bugs in the previous beta. Most importantly, printing bugs are fixed and files are backward compatible with version 1.2. You can see the full list of fixes and features here. Download it from the download page. Note that you must select the beta 2 version from the detailed list of downloads; the large "Download Now" button downloads the most recent stable version (currently 1.2.2). Version 2.0.0 Beta 1 is released. This adds many new features. You can see the full list of new features here. Download it from the download page. Note that you must select the beta version from the detailed list of downloads; the large "Download Now" button downloads the most recent stable version (currently 1.2.2). Version 1.2.2 is released. This adds an German translation, thanks to Andrea Schultze. Version 1.2.1 is released. This adds an Estonian translation, thanks to Tarmo Klaar. Version 1.2.0 is released. This includes support for OCAD version 11 files, and a few bug fixes. You can see the full list of fixes here . Version 1.1.5 is released. This includes two new translations, and a few bug fixes. You can see the full list of fixes here . Version 1.1.4 is released. This includes three new translations, and a few bug fixes. You can see the full list of fixes here . This a fix to 1.1.3, which had a buggy install program. Version 1.1.3 is withdrawn, due to a buggy installation program. Version 1.1.3 is released. This includes three new translations, and a few bug fixes. You can see the full list of fixes here . Version 1.1.2 is released. This includes some small additional features, and several bug fixes. You can see the full list of fixes here . Version 1.1.1 is released. This includes a brand new Norwegian translation, and several bug fixes. You can see the full list of fixes here . Version 1.1.0 is released. This includes OCAD 10 support, more flexibility in course numbering, control numbers, and score courses, and single step creation of files for RouteGadget. You can see the full list of fixes here . Version 1.0.2 is released. This makes Purple Pen more resilient to unexpected data in OCAD files, and also adds a white-out area special object. You can see the full list of fixes here . Version 1.0.1 is released. This fixes two bugs in 1.0.0. You can see the full list of fixes here . Version 1.0.0 is released. This has a few bug fixes from 1.0 release candidate, and updates the French and Swedish translations.You can see the full list of fixes here . At long last (sorry it has been so long), a new update is ready. This is 1.0 release candidate 1. This release now is translated into French and Swedish, and also has some nice new features. I plan to have a 1.0 release in a few weeks, only fixing any bugs that people might come across. Thus, it would be great if people can try out the new release as soon as possible and report any problems. You can see the full list of changes and fixes here . Instructions for how to help translate Purple Pen to other languages has been posted here. If you have some time and are a fluent speaker of another language, please consider helping translate Purple Pen! The hosting for the code, bug reports, hoped-for-features of Purple Pen has been moved from SourceForge to LaunchPad. Beta 3 of Purple Pen is ready. This release fixes a couple of nasty bugs and hopefully makes printing work well on all printers. There are also some new features: the All Controls display has several enhancements, and the new Event Audit report checks your event for many possible problems. Beta 2 of Purple Pen has finally been released. The main new features are listed in the new item below. You can see the full list of changes and fixes here . I hope that the new version works well for many of you. As always, please let me know what fixed and features you would like to see in the future. Work continues on Beta 2 of Purple Pen. Hopefully it can be released in March. Stay tuned! You can easily change the map file associated with an event. Also, if the map file cannot be found when an event is opened, PP kindly asks you to find the map file. A JPEG, TIFF, or BMP file can be used instead of an OCAD map for the map file. You must specify the resolution of the bitmap and the scale of the map manually in this case. A new report to show the lengths of all legs. Control descriptions on the map now appear in black instead of purple. You can customize the text associated with any description symbol. This is especially useful for the special item symbols. You can also add a key at the bottom of description to show what the special item symbols denote. Purple Pen now correctly displays and print almost all features just like OCAD, so the Print Courses command now is recommended for use. For those few features it doesn't support, PP will detect and warn you before you print. Please keep the feedback coming! It is very useful in deciding what features are really needed. © Golde Inc. All rights reserved.